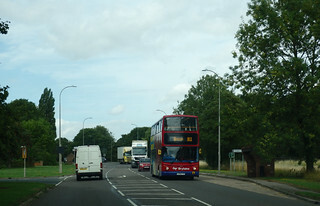 Local coach operator Grayscroft has a depot in the Town Centre at Victoria Avenue and operates school buses and also market-day services from Mablethorpe, including a Tuesday run to Grimsby and a Tuesday/Friday run to Louth via Theddlethorpe, Saltfleetby & Grimoldby. I forgot to mention that Grayscroft has some ex-Metrobus London Scania OmniDekkas in its fleet for the school and market-day runs. 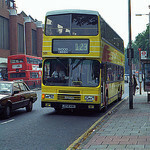 I also snapped an ALX400-bodied Dennis Trident of Hunt's Coaches in Chapel St Leonard's on the no. 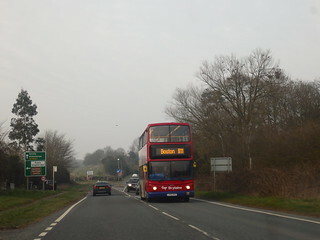 7 Skegness-Alford route. 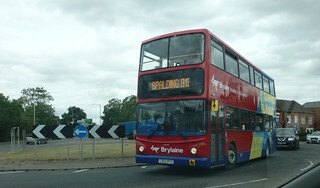 It was formerly Stagecoach London 18232 and still carries its London registration LX04 FXY. Brylaine of Boston also have a few ex-Stagecoach London Tridents which operate on several of their routes radiating out of Boston. I snapped a couple of those when I was passing through the area, I will post those later. 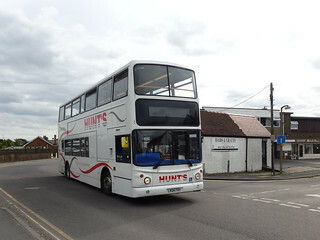 As promised, here are some photos of Ex-Stagecoach London ALX400-bodied Dennis Tridents now at work with Brylaine Travel of Boston, Lincs. Just got back from Gdańsk, Poland. By far the best 4 days of 2018 for me. What a fantastic city and great people. The transport here is excellent. As with many Central European cities the trams are just brilliant and so are the buses. The trains were quite good too - certainly better than Southern and SWR . And it was all so cheap! I’m currently in Rome. Can rest assured bus usage is far from declining here - most buses i’ve seen are packed to the rafters which appears to be the norm. Their Metro is very simple and basic. If it were any other city I’d imagine the metro would be far more comprehensive but attempting to dig in a place like Rome is impossible for obvious reasons! Lots of lovely Merc citaros too! Bus use in Rome is insane on some routes. How buses have burst into flames while you are there? The whole ATAC organisation is under siege. 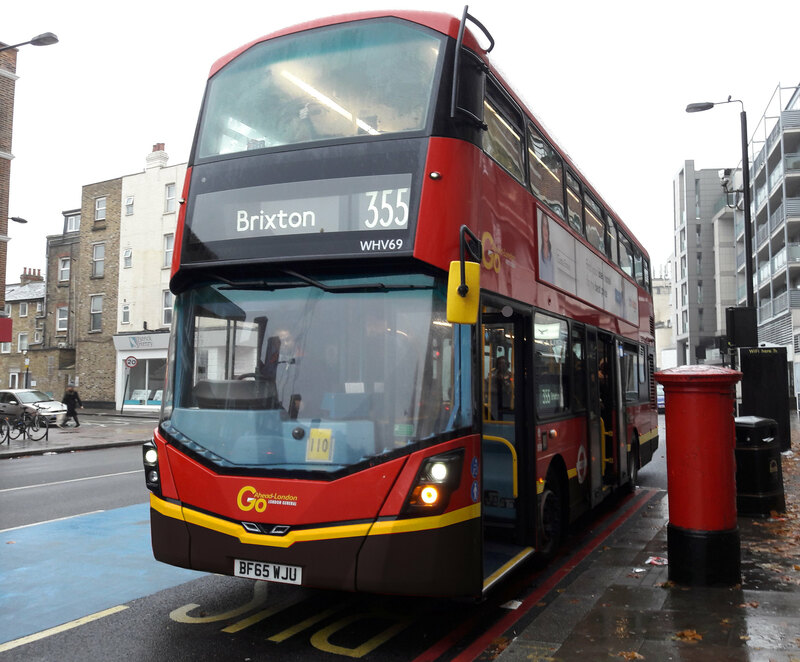 There was some sort of local referendum recently as to how it should be run with the politicians squabbling like alley cats as to who is to blame for the exploding buses and general inefficiency of the operation. Didn't Rome's second metro line take about thirty years to build, or something like that (I think there were a few hiatuses during that period)? Makes Thameslink/Crossrail and the rest child's play in comparison! My only experience of Rome's public transport came on a school trip, so you can infer how long ago it was, but I did get to travel on a single deck trolleybus for the first time in my life. 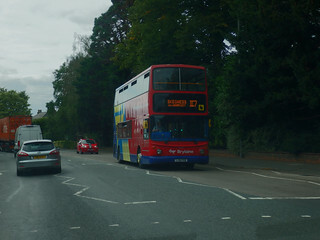 When I say on it, I don't mean inside it, we were clinging to the outside, and that's how busy the route was. It passed our 'hotel', was numbered route 64 and every trolleybus I saw during the few days we were there was packed to the gunnels. I believe there were some ancient trams down by the station, but don't recollect seeing them. The ancient trams, on the inter urban, are still there to some extent. Unfortunately one interurban route has been cut back severely by part of new Metro Line C. You are quite right that Metro construction takes a long time - the rest of Line C is taking forever to creep across the central area. On my one trip to Rome I caught in a horrendous rain storm (no brolley) and ended up on a 64 (run with Citaros) back to my hotel. All I did was drip an enormous puddle on to the bus floor to the great amusement of the locals on the bus. lol 😂😂😂,as the locals were amused,that rarely happens there I guess? The main amusement on my trip was, inadvertently, caused by me in the 'hotel' when a group of us 15/16 year olds were smoking in a room when a teacher came in and, in an attempt to camoflage my cigarette, I reached up to put it on a chandelier and brought the whole edifice down. Still, for the only time in my whole school life I was briefly considered 'cool'.